Not all fractures are severe like that of Colin Hank’s. It usually depends on the impact or force that caused the break. 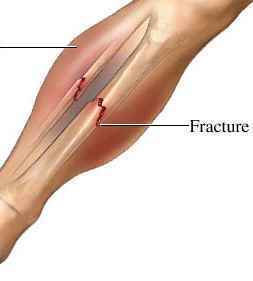 A fracture is when a bone breaks or cracks. The fracture can either be caused by a direct force (blow breaks the bone at the point of impact), indirect force (blow breaks a bone at some range from point of impact) or abnormal muscular contraction (sudden muscular contraction leading to fracture). There are different types of fractures, some of which are open, closed, complicated, stress and greenstick. An open fracture occurs when the bones break and causes the skin to break, hence resulting to an open wound. A closed fracture occurs when there is no skin break and just a broken bone. However, if there is damage to the neighboring organs, it is called a complicated fracture. When there is repeated stress to the bone causing a hairline crack, it is called a stress fracture. More commonly found in children is a greenstick fracture, which is an incomplete fracture wherein the bone is bent. Symptoms of fractures include severe pain, abnormal twist of the limb, difficulty in movement, pain on the bone upon applying pressure, swelling, bruising and for open wounds heavy, bleeding. Sometimes, the extremity of the fractured bone, the finger and toe digits, is bluish or numb. If any of these symptoms are observed, immediately call for emergency medical assistance. Do not attempt to move the victim unless there is danger in the immediate surroundings, especially if victim is suspected of neck injury. The first aid performed on a fracture varies on the type of fracture and its location. If the wound is open, apply direct pressure on the wound using a clean piece of cloth to cease the bleeding. Rinse the wound with clean water. Dress the wound using sterile gauze. The next step for treatment can be used for both open and closed fractures. Check for breathing and pulse, and if there is none, begin CPR. Reassure the person. Check for other injuries so they can be attended. Immobilize the injured area and do not try to push the realign bone back to its original position. Moreover, the affected area should not be elevated. If one is trained to apply splints, apply a splint to the region above and below the fractured bones. Boards, rolled newspaper and numerous other materials may be used for splints. To reduce discomfort, splints may be padded. Slings may be used for arm or shoulder injuries. To reduce swelling and assist in relieving pain, apply ice. Ice must not be directly applied to the skin. It should be wrapped in a piece of cloth or another material. If shortness of breath is observed, advise the person to lie down with the head marginally lower than the trunk. Do this also if the victim is feeling faint. Raise the legs if possible. Athletes are strongly advised to learn proper treatment for fractures, dislocations and other bone and muscular injuries. Proper treatment maybe learned in first aid training.